In the summer, we like to take our strength-training clients to our on-site private pool as an alternative to their dry-land workouts in the gym. 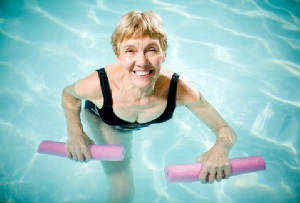 Aquatic exercise supports aerobic fitness, muscle strength and endurance, flexibility and balance. Because working out in water is easier on the joints, clients with knee and other joint problems are able to perform exercises in the water that they cannot perform comfortably on land. The water cools more efficiently than air, so being in the water even on a hot, sunny day, helps prevent overheating. According to the Aquatic Exercise Association (AEA), the typical aquatic exerciser burns between 400 and 500 calories per hour. Although a person doing an aquatic workout generally has a lower heart rate than a person running or walking on land, cardiovascular benefits are comparable since certain factors (such as lessened gravity, pressure, and the cooling effect) influence the exercising heart rate when submerged in the water to mid-chest. We like to exercise in the pool because it's safe, effective and fun! Where else can you do strength training with a bright yellow pool noodle and funny little blue foam barbells? PS: If you are afraid of the water, be aware that we train in the shallow end of the pool. Your head never needs to go underwater.